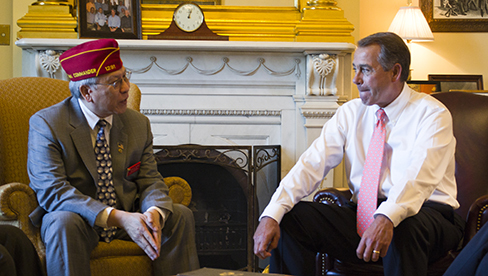 National Commander Fang Wong chats with House Speaker John Boehner. As part of his lengthy recent visit to Capitol Hill, National Commander Fang A. Wong, along with American Legion Legislative Director Tim Tetz, met with Rep. John Boehner, Speaker of the U.S. House of Representatives. Despite his full calendar, Boehner set aside a few minutes to chat informally with Wong. Boehner, a member of American Legion Post 218 in Middletown, Ohio, and two-time speaker at the Legion’s national convention, sat down with Wong for a relaxed 15-minute conversation. During their meeting, Wong had one request: Would Boehner do what he could to fast track “The American Legion Charter Modernization Act (S.1639)” in the House? The bill amplifies the legal autonomy of Legion posts and departments and allows for centralized collection of membership dues. 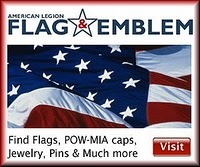 Since the Legion is a congressionally chartered organization, all changes to its charter – which dates back to 1919 – must be approved by Congress and signed into law by the president of the United States. The Legion charter change act passed the Senate late on the night of the Boehner-Wong meeting. Boehner said he felt the House version, introduced this past summer, wouldn’t have any problems moving quickly through the House.